In Microsoft Word, you can automatically generate a bibliography (or other similar document requiring citations) of the sources you used to write your paper. Each time you add a new citation to your document, Word adds that source so that it appears in the bibliography in the proper format, such as MLA, APA, and Chicago-style. 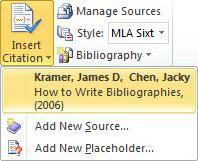 For information on creating your bibliography, see Create a bibliography. On the References tab , in the Citations & Bibliography group, click the arrow next to Style. Click the style that you want to use for the citation and source. Click Insert Citation and then select Add New Source. In the Create Source box, type in the citation details, and then click OK. When you've completed these steps, the citation is added to the list of available citations. The next time you quote this reference, you don't have to type it all out again, just click Insert Citation and select the citation you want to use. Important: APA and MLA can change their formats, so you’ll want to ensure that these format versions meet your requirements. You can create your own updated version of a style or build custom styles. For more information see Bibliography & Citations 102 – Building Custom styles. Click where you want to insert a bibliography. Typically, they are at the end of a document. On the References tab, in the Citations & Bibliography group, click Bibliography. Similar to the Table of Contents builder in Word, you can select a predesigned bibliography format that includes a title, or you can just click Insert Bibliography to add the citation without a title. If you want to learn more about using citation placeholders and editing sources, take a look at Create a bibliography. Or, if you want to export your bibliography sources to another computer, check out this post on the Microsoft Word blog. APA 6th Edition citation style fix procedure. In the Word document, click the citation. Click the down-arrow, and then click Edit Citation. Click the Title checkbox, and then click OK.
APA and MLA can change their formats, so you’ll want to ensure that these format versions meet your requirements. You can create your own updated version of a style or build custom styles. For more information see Bibliography & Citations 102 – Building Custom styles. 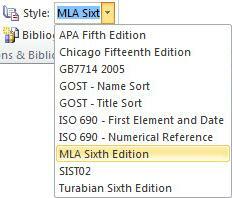 If you are using the APA 5th Edition citation style, there’s one issue you should be aware of. APA style uses the author's name and publication date. If you have multiple citations from the same author, there is a known Word 2010 bug where the citation generator fills in the publication title when it's not supposed to. If this happens to you, see the section entitled, ‘APA 5th Edition citation style fix procedure below. In your Word document, click on the References tab in the Ribbon. In the Citations & Bibliography group, click the arrow next to Style. Type in the citation details and then click OK. When you've completed these steps, the citation is added to the Insert Citation button, so the next time you quote this reference, you don't have to type it all out again. Click where you want to insert a bibliography. Typically they are at the end of a document. Much like the Table of Contents builder in Word, you can select a predesigned bibliography format that includes a title or you can just click Insert Bibliography to add the citation without a title. 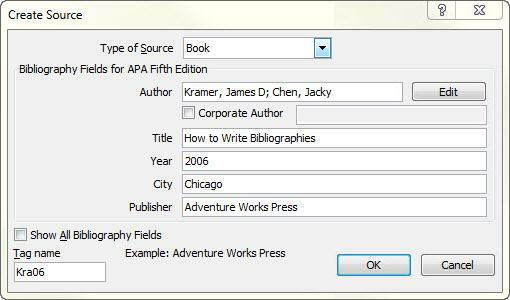 If you want to learn more about using citation placeholders and editing sources, take a look at Creating a bibliography in Word 2010. Or if you want to export your bibliography sources to another computer, check out this post on the Microsoft Word blog. Click the down-arrow and then click Edit Citation. 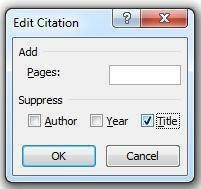 Click the Title checkbox and then click OK.
You can't automatically generate citations in Word Online. 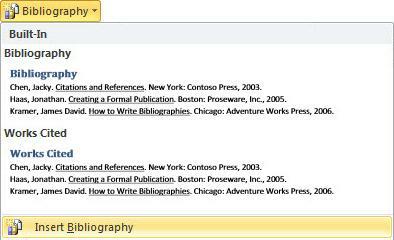 Word Online preserves the bibliography in your document, but it doesn’t provide a way to create one. 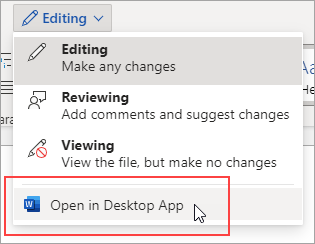 Instead, if you have the desktop version of Word, use the Open in Word command to open the document. Then follow the steps for Word desktop. When you’re done and you save the document in Word, you’ll see the table of contents when you reopen the doc in Word Online.